The first day of the J/70 UK National Championship will be remembered for classic sea breeze racing in the Solent. Royal Yacht Squadron PRO, Simon van der Byl, and his dedicated team, set four superb courses. Using the Hill Head Plateau to keep the competitors out of most of the four metre tide, the windward leeward racing produced some spectacular J/70 action. Whilst the leaders got away into fresh breeze, at just about every mark rounding, the peloton behind were fighting for room. 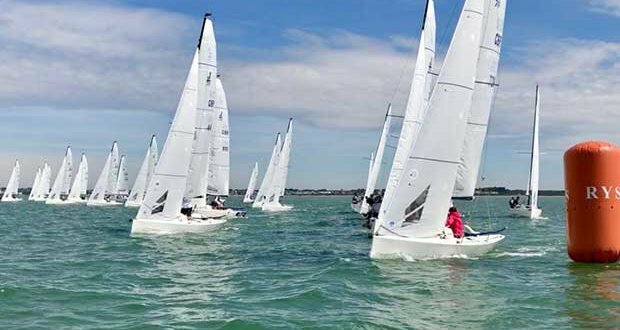 Defending UK National Champions; Calascione and Ripard, racing Harlequin (RYS) did not win any of today’s races, but their consistency (four – two – two – two) was enough to lead the championship by three points. an Wilson’s Soak Racing (RSrnYC), won Race Two but finished the day in second place, three points behind the leader. Martin Dent’s Jelvis recovered from a poor result in Race One, to win Race Three, and to finish the day in third place ahead of the chasing pack. The intensity of the competition was evident by Jeremy Thorp’s Phan (RSrnYC), failing to make the podium in any race, but finishing the day in fourth. Clive Bush (CYC), is tied on points with defending Corinthian champion, Patrick Liardet (RSrnYC). However, the team from the Chichester Yacht Club won Race One, and is ahead on countback. Jack Davies young team Yeti (RSYC), is in seventh place, and top youth team. 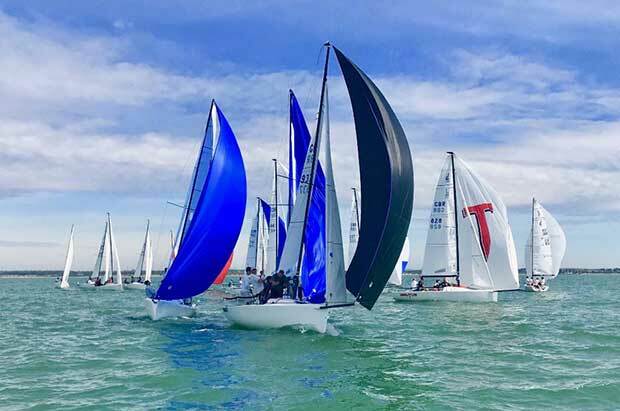 Action at the J/70 UK National Championship continues, Saturday 8th July, with four windward leeward races scheduled in the Solent.